Will Packers bring more opportunities for NFL 'ironman' Rudolph? He’ll play in his 60th consecutive regular-season game, which ranks No. 1 among active NFL tight ends. Remember when the knock on Kyle Rudolph was his lack of durability? Back when he missed 15 of 32 games in 2013-14? Well, now the big fella heads into Sunday night’s game against the visiting Packers as one of the NFL’s current “ironmen.” He’ll play in his 60th consecutive regular-season game, which ranks No. 1 among active NFL tight ends. Washington’s Vernon Davis is second at 54. Granted, Rudolph’s streak contains the least “iron” among all positions. But, hey, he’s in the group and has not missed a game since 2014. Rudolph has had an up-and-down year as one of Kirk Cousins’ receiving targets. From Weeks 2-6, he had a five-game stretch of five or more receptions. But he’s also had four games with fewer than three catches, including the last two games. With 36 catches for 362 yards, Rudolph is on pace for 58 catches and 579 yards. Both would rank second in his eight-year career, just ahead of last season’s totals and behind his career year — statistically speaking — of 2016 (83 for 840). However, scoring-wise, Rudolph has two touchdowns and is on pace for his fewest trips to the end zone since his career-low of two in nine games in 2014. Perhaps the Packers will bring an opening for Rudolph in the passing game. His season highs for catches (seven) and yards receiving (72) came in the 29-29 tie at Lambeau Field in Week 2. Two of those catches for 16 yards came during the game-tying drive at the end of regulation. 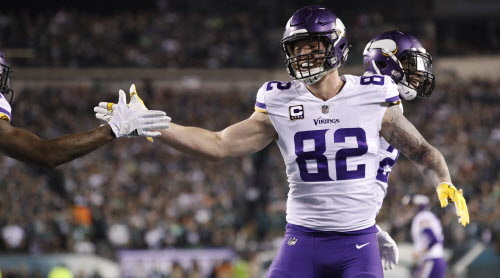 Can Vikings keep up with NFL's fearless offenses?